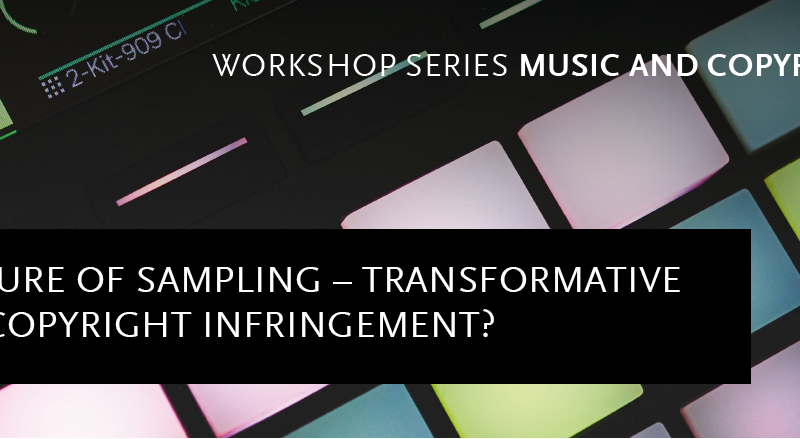 Workshop: The Future of Sampling – Transformative Art or Copyright Infringement? Plenty of sampling cases have reached the courts in Europe and the US over the past years. The approach taken by the courts ranged from requiring a licence for any kind of sample to stressing the importance of freedom of the arts and allowing sampling without compensation. The Metall auf Metall case that has kept German courts busy for years is pending a decision of the European Court of Justice. What will the future of sampling and copyright look like? We invite an interdisciplinary group of experts in the field to contribute their perspective. From musicians and producers to social scientists and lawyers, we will discuss what the reality of sampling looks like today, which issues we identify and where reform ideas may be needed. Please note that the workshops are not open for public. If you are interested in joining this or another upcoming workshop of the series, please get in touch with Jana Leusing for further details and registration.